It’s raining the day I visit Cowtown and I don’t have an umbrella. A real shame as there are black and white fibreglass cows all over the place. There’s even a gold one on top of a pole in the park that looks as though it’s about to do a spectacular swan dive into an imaginary pool. This is Cowaramup, more commonly known as Cowtown, and boy don’t the locals play on its cow-theme. In 2012 the town installed 42 of these life size cow sculptures to attract tourists and in July 2014 the town set a Guinness World Record for the largest group of people – 1,352 – dressed as cows! 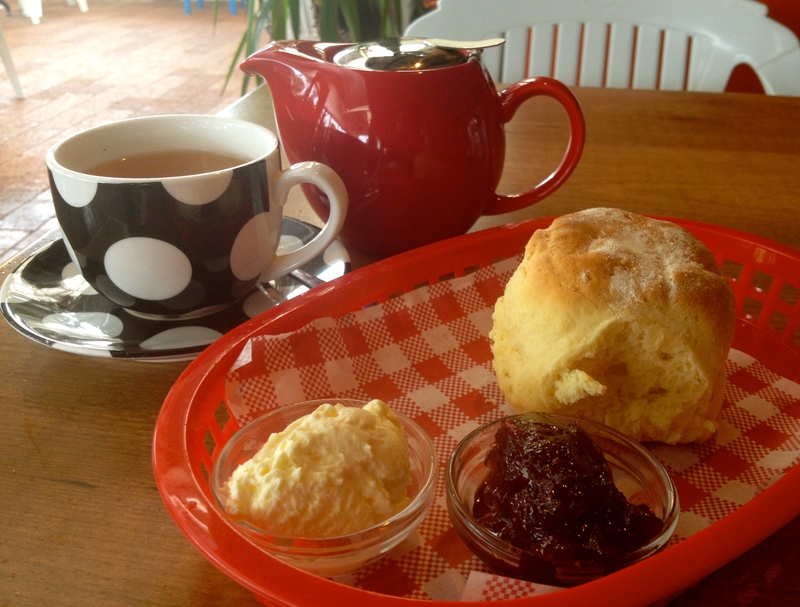 I visit the first café I see advertising scones, and it’s Cowtown Diner & Burger Bar’s ‘Devonshire Tea for 1 or 2’, that grabs me. I love the black and white polka dot cup and saucer that instantly reminds me of a Friesian cow, how apt. The scone is a bit crumbly, but surprisingly good for a burger bar, and the lovely thick cream makes up for the average jam. Tea: The usual variety of teas available at cafes, all loose-leaf served in a good-sized pot. Overall: A surprisingly good spread in a quirky town that deserves a visit for the ‘fun’ factor.